Much of the early history on this local history page comes from a booklet produced to celebrate the Millennium by Temple Sowerby Villagers, many of whom shared their memories for the publication. Many thanks to the Millennium Book Committee for allowing us to reproduce this. Sowerby – Danish for a farm or settlement with muddy or poor soil. The red sandstone village of Temple Sowerby is situated in the Eden Valley between the Pennines and the north eastern quarter of the Lake District National Park. It stands astride the present day trans-Pennine route, the A66, approximately 7 miles east of Penrith and 7 miles north west of Appleby-in-Westmorland. The main watercourses nearby are the River Eden joined by the Crowdundle Beck to the north and the Lyvennet to the south of the village. The attractive village centre is a mixture of tightly-knit buildings arranged around informal greens with further development along the A66. The surrounding landscape consists mainly of enclosed agricultural pastures with some woodland. Historically Temple Sowerby grew as an important residential village on lines of major communication, first the road and then the railway (now closed). This is reflected in many of the fine houses in the village today. These lines of communication had in turn given rise to a large number of varied businesses, many of which have now gone. Today the village is a mixed farming/working/residential community with its inhabitants comprising an integral blend of long established locals and those whose roots were elsewhere. The village still enjoys many facilities lost by less fortunate communities and retains some businesses both traditional and new. Britain is invaded in AD 43 under Emperor Claudius and progressively conquered and colonised. It becomes the north western outpost of a vast and powerful empire. Roman administration lasted in Britain for almost 400 years and during that time the country experienced great building enterprises; both civilian and military. The period ends with the country and many of its citizens being thoroughly Romanised”. The first evidence of Roman presence in the Eden Valley was in the 70s AD and it was during the governorship of Julius Agricola (78 – 84 AD) that the trans-Pennine Roman route known as Iter II was consolidated. (This in part follows the A66). The Romans developed this remote north western fringe of their empire as predominantly a military zone typified by forts and inter-connecting military roads. In productive farming areas like the Eden Valley there would have been small scattered farmsteads growing crops and producing food for themselves and the Roman army. During this period nothing is known of any settlement at Temple Sowerby. Near to the present village are the sites of Roman forts at Kirkby Thore (Roman Bravoniacum) c. 2 miles to the south east and at Brougham (Roman Brocavum) c. 6 miles to the west. There is also a significant Roman milestone in situ by the A66 on the south eastern outskirts of the village. On the larger scale, about 25 miles to the north of Temple Sowerby, stands evidence of that great Roman frontier line – Hadrian’s Wall. The Anglo-Saxons were a major group of people of Germanic background comprising mainly the tribes Angles, Saxons and Jutes. They moved into southern Britain following the departure of Roman administration in the early 5th century. They controlled what was to become England for most of the time between the departure of the Romans and the arrival of the Normans in 1066. The term Anglo-Saxon was used to distinguish the Saxons in England from those remaining in Continental Europe. It has since been used to describe all inhabitants of England before the Norman Conquest. By the 8th century the Anglo-Saxons had divided England into seven large kingdoms. The most powerful of the Kingdoms then was Northumbria. This was a vast area that stretched coast to coast from the Forth and the Clyde in the north to the Humber and the Mersey in the south. It was an area noted for being a seat of early Christianity. What was to become the settlement of Temple Sowerby was in the vast, powerful Kingdom of Northumbria. Around this area, in the richer more productive agricultural land of eastern Cumbria, Anglo-Saxon settlements had been established since about the 7th century and these are evident today in their place names. For example, settlements with names ending in …ston (Bolton, Long Marton and Dufton) and those with names ending in ….ham (Askham) indicate Saxon origin or Saxon naming. In the 9th and 10th centuries Scandinavian people settled extensively in the Eden Valley alongside some of the earlier settlements of the Anglo- Saxons. It is around this period that some sort of settlement at Temple Sowerby may have had its origins. The ….by place name element is generally attributed to a Danish origin and the word Sowerby is from the Danish for a farmstead or settlement with muddy poor soil. The prefix Temple was not used at this time and did not appear until later in the 13th century. Although the area was settled extensively by Anglo-Saxons and Danes the native Celtic heritage was not immediately lost and indeed some historians say that in Cumbria the Celtic language did not die out completely until the 14th century. Celtic place names are evident in Cumbria with Penrith being an example. The Norman conquest of England was a major event in world history. The Normans were descendants of Vikings (Northmen) who had become established in north west France (Normandy) by the early 10th century. There was a close connection between the Dukes of Normandy and the English Crown and confusion over Edward the Confessor’s successor to the English throne led to the Norman invasion of England. The greater medieval period (from the Norman Conquest through into the 16th century) was a period of change and turmoil. The feudal system was established in which the upper levels of a military society assigned land to those below them in return for military service. This led to the creation of great baronies. Castles were constructed, monasteries and other religious orders were founded with the granting of much land and many churches were built. The period was punctuated with failed harvests resulting in famine. There were numerous outbreaks of bubonic plague during the medieval period and the most disastrous of them all was the Black Death in the 14th century when about one third of the population of the country died. Wars and violence typified the period and Kings struggled to control powerful and often rebellious barons. The medieval period drew to a close with Henry VIII dissolving the monasteries in the late 1530s. This paved the way for later religious reformation when Henry VIII’s successors moved England from being a Catholic nation to a Protestant one. Here in the north the Normans established control by the late 11th century. What was to become Temple Sowerby was in the great Barony of Westmorland under Ranulph de Meschiens. Norman castles were built nearby at Brougham and Brough controlling the major trans-Pennine route, which ran through Temple Sowerby. Many monasteries were founded throughout Cumbria in the 12th century, the nearest being Shap Abbey. The Knights Templar (full title – Poor Knights of Christ and the Temple of Solomon) was an order of knighthood founded in c. 1 120 for the protection of pilgrims to the Holy Land during the time of the Crusades. They were soldier-monks. They were given land and were first recorded in England in 1185. They were given the manor of Sowerby in c. 1228 and by 1279 a document had the prefix Temple given to this manor. From this time originates the village’s present name. The Knights Templar were suppressed in 1312. The reasons for this were that the Templars were seen to have become arrogant, quarrelsome with the Knights Hospitallers and to have succumbed to luxuries – in short they had deviated from their monastic ideals. On the Templars’ suppression, the manor was passed to the Knights Hospitallers. The Knights Hospitallers (full title – Knights Hospitallers of St. John of Jerusalem) was also a religious military order founded c1144 during the Crusades. Following the Dissolution of the Monasteries in the late 1530s the Knights Hospitallers were likewise dissolved and the manor forfeited to the Crown. From the 14th century the area adjacent to the English/Scottish border both north and south was subjected to disruptive raids which developed into the family feuding of the Border Reivers. It is not certain whether Temple Sowerby was directly affected by these raids but Penrith was. Mainly, however, the troubles were further north. The village settlement of Temple Sowerby would have continued to develop through the medieval period and the form of the village today, being a mainly rectangular layout with buildings grouped around a central green and strip fields radiating out from the village, displays a form associated with the 13th and 14th centuries. Ordinary buildings of the medieval period would most probably have been of the cruck-framed style (large curved timbers in pairs running from ground level to roof ridge height and forming an inverted ‘V’) with walls of rough stone and clay and roofs probably thatched. Black Swan House (53) (dating from pre-Elizabethan times – 1558 to 1603) today incorporates an earlier cruck-frame. This house, together with Swan Cottage (54) and Lowthian Cottage (11), was once thatched. The Dissolution of the Monasteries meant that former monastic land came, via the Crown, into the ownership of private individuals. As much of this land was then farming land, this saw the increase of the Yeoman farmer class who held enough freehold land to be able to support their independence. Eden Bridge was rebuilt in the 16th century (1575) by subscription. This was an important crossing point on a major route. Also in the 16th century a farmhouse was built where Temple Sowerby House Hotel now stands and it is believed that the present coach house dates from that period. This period is one associated with increased peace, stability and prosperity (despite the Civil War in the middle part of the century) particularly in the North. This began with the accession of James V/ of Scotland to the English throne as James l, thus uniting the crowns of England and Scotland. A resulting change of political will saw the end to centuries of border conflict that had blighted the region for so long. The century, in Cumbria, is associated with a major rebuilding in stone replacing wood and other materials of the lesser dwellings and farmhouses in particular. The major rebuilding in stone happened all over the region and Temple Sowerby was no exception. Typical building materials in the village would have been red sandstone with Westmorland Green slate roofing and in some cases red sandstone flag/slab roofing. This type of building material continued to be used during later periods of building. Today architectural features from this period still exist, for example at Rose Cottage(42) there is evidence of a cross passage and also, in 1616, a barn was added to a farm owned by the Hall family. 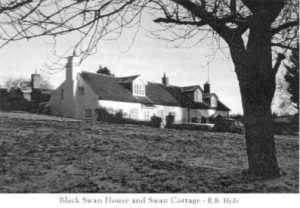 That farm is now Black Swan House(53) and the barn has been converted to a cottage called Swan Cottage(54). Lady Anne Clifford, daughter of George Clifford the 3rd Earl of Cumberland (1558 – 1605), purchased an estate in Temple Sowerby in 1656. Countess Farm (63) here in the village was part of that estate. Richard Lowes, House Steward to Lady Anne Clifford, left land in the village for poor widows and fatherless children. First records relating to Temple Sowerby School were in 1673. Historians often view the 18th century as being a golden age in which art, literature, music and architecture flourished. In Britain this period is known as the Georgian period, as most of the 18th century saw the rule of the first three King Georges. During this period Britain became the most important manufacturing country in the world and there were great advances in agriculture with much farm land being enclosed. This period saw the beginning of a sophisticated road system with the establishment of turnpike roads thus heralding the era of stage coach travel and coaching inns. There was great prosperity and many fine houses were built and existing buildings rebuilt or modified in the elegant classical architectural style of the day. The 18th century also witnessed the advent of Methodism, an evangelical Christian movement led by John and Charles Wesley. John Wesley travelled widely (about 5,000 miles each year) preaching in the open air his message of individual salvation. Temple Sowerby experienced much development at this time as its impressive collection of Georgian buildings indicate. They give the village a somewhat grander appearance than many other villages in the area and because of this the village is referred to as “The Queen of Westmorland Villages”. The present Parish Church of St. James was built in this century. It is a long held tradition that John Wesley founder of Methodism, preached in the open air from a stone on the village green. 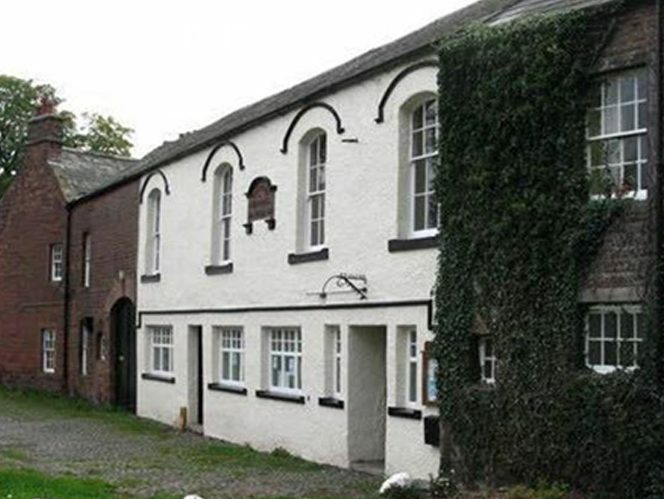 Wesley was here in the 1780s, records do not show when, but possibly he preached in the village in 1786 on the day he preached in Appleby in the afternoon and then travelled to Penrith. During the latter part of the century a turnpike road was built between Penrith and Darlington. (A turnpike road was a defined stretch of road which, by Act of Parliament, came under the jurisdiction of a trust. The trust, in return for its proper maintenance, collected a toll from the road users). Temple Sowerby was a stop on this road with stabling for horses being provided at The Kings Arms Hotel. West View Farm (2) was also, for a while, a Coaching Inn called “The New Inn”. The turnpike road improved communications which resulted in the growth of the village as a trading centre. This increased prosperity brought gentry to the village and generally heralded the building of many of the fine 18th and 19th century houses which we see today, such as The Grange(7), Beech House (37), Sheriff House (39), Linden House (83) and part of the existing Temple Sowerby House Hotel. The extraction of gypsum has been recorded at Acorn Bank quarry from at least 1790. For Britain in general this century was one of social and religious reforms. Great social injustices were being identified and rectified. There were great advances in technology and Britain became a world power both militarily and industrially with a huge empire. A system of elementary education for all children was developed by the Church with the Government becoming involved later. It was also the age of the railways and a vast railway network was being laid to every part of the country. Temple Sowerby had a population in 1841 of 381. There were 82 houses recorded with 7 of them being uninhabited. Building continued in Temple Sowerby throughout the nineteenth century with many buildings continuing to be constructed of traditional red sandstone under Westmorland Green slate roofs. Welsh slate was used in some cases and for some buildings, especially along the A66, brick was used. In the early years of the 19th century four large annual sheep and cattle fairs were established in the village. This century saw considerable ecclesiastical building work in progress with the Methodist Chapel being built in 1872 and the Parish Church enlarged in 1875. Methodism was practiced in the village before 1872 and there are recollections in the 19th century of cottage meetings taking place and also meetings being conducted in a building which is now adjoining Tendot Barn(4). The stone on Maypole green, from which Westley preached in the 1780s, was removed and later placed by the entrance to the new chapel and detailed reports of this stone laying ceremony appeared in the Penrith Herald and the Cumberland and Westmorland Advertiser. At the beginning of the 20th century Britain saw the end of the Victorian Age and the start of the extravagant and heady Edwardian period with King Edward VII on the Throne. This was all to change and two World Wars left Britain declining as a world power with its empire dissolving. The wars left millions dead and no community is without its poignant War Memorial. The nation had to adjust in the latter half of the century with its decline in status and the loss of many of its traditional industries in mining and manufacturing. There were tremendous advances in medicine, housing, farming and working conditions. In the field of technology there were more advances than were ever thought possible at the beginning of the century. Farming experienced a revolution in mechanisation with far fewer people working on the land. The numbers of individual farms reduced during the century whilst productivity increased dramatically. This century also produced a revolution in transportation, both commercial and private, with the development of the internal combustion engine and the emergence of a road network as the prime means of travel. There were major road building programmes during the second half of the century with a motorway system being established nationwide and many by-passes constructed. Advances in transportation had profound changes in employment. The greater mobility given to the population changed where we worked, where we lived, and how we shopped. Temple Sowerby reflected much of what was happening nationally. The two World Wars, 1914/18 and 1939/45, affected the village in the same way as many villages throughout Great Britain. The dreadful loss of life is reflected in the memorials in the Parish Church, Wesleyan Chapel and Victory Hall. As mentioned in the section on the Parish Church, evacuees came to the village from Newcastle-on-Tyne and friendships formed still exist today. During the 1939/45 War the iron railings around the Churchyard, as well as from some other properties in the village, were removed to help the war effort. Also during this war the local Home Guard had a shooting range by the River Eden at Oglebird Scar and evidence of this can still be seen by two matching, fairly large, holes in the red sandstone where hundreds of bullets – 303 and sten gun – did their damage. Before nationwide county boundary changes Temple Sowerby was in the County of Westmorland. In 1974 the Counties of Cumberland and Westmorland were combined to form the greater part of the new County of Cumbria. 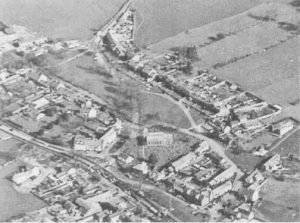 Electrification of the village was completed just before Christmas 1947 when Park House Farm(85) was connected. Building continued to develop and the use of more modern building materials is evident. A residential estate was built at Croft Place(97) by the local Council in the 1940s. It has been enlarged twice, once in the 1950s and again in the 1970s, some of these are now privately owned. A private residential development (7779) opposite the Kings Arms Hotel commenced in the late 1990s and a further private development is planned in the field behind Eden Garage. Many trades and industries have come and gone in the village during the 20th century. The advent of the personal computer and ICT (Information and Communications Technology) has greatly improved business operations and has meant that more and more businesses can be run from domestic premises. Temple Sowerby today has examples of such businesses. As you walk around the village today you can see reminders of the past in many of the house names – Smithy House(60), Tannery Cottages(28,29) Joiners Yard and Black Swan House(53) are all examples of present day names which reflect the nature of the village in the past. Although the village lost its railway (in 1962), it is just seven miles from the main west coast line railway at Penrith. The Carlisle to Settle and Leeds railway can be joined at either Langwathby or Appleby. There is also a good road communication with the A66 linking closely to the M6 motorway at Penrith. Due to the development of road transportation, the more efficient movement of goods and the increased mobility of the village population has meant that many of the businesses and trades have now gone. Farmers were major employers along with Thomas McGhie & Sons at Acorn Bank Mine, Birks Mine and Kirkby Thore Mine. The small village tradesmen also employed two or three workers. Twentieth century Temple Sowerby has been a lively and busy community which has seen many changes without losing its character and sense of identity. The people of the village and surrounding area have joined together in a variety of social and cultural events. Temple Sowerby was chosen as a site for one of the ten Millennium Benchmarks along the River Eden. Victoria Brailsford created the sculpture whilst artist in residence at Acorn Bank. It is a series of spheres on a terraced base made from Lazonby Sandstone. Sited on a high embankment overlooking the River Eden, it is an elevated place to view the River Eden and hills beyond. Since the A66 bypass has been constructed there is now also a fine view of the bridge that spans the River Eden. You can reach the sculpture, named Red River, via the footpath at the edge of the Cricket Pitch. The sculpture was commissioned by the National Trust in collaboration with the East Cumbria Countryside Project. It was unveiled on 26th February 1999. To see other Eden Benchmarks Click Here. The Maypole is a symbol believed to have arrived with the Anglo-Saxons and is traditionally a feature of May Day Spring Festivals. Part of May Day Festivals at one time was a lying competition when competitors told the most unlikely stories. The winner was awarded a grindstone, apparently to keep the wits sharp. The story goes that a Bishop arrived during one May Day celebration in Temple Sowerby and condemned it in public, stating that he had never told a lie in his life. He was immediately awarded first prize! There has been a Maypole in the village from at least 1817, when it was mentioned in an Enclosure Award. A new Maypole was erected in 1848 and replaced in 1884 by a Maypole provided by Lord Hothfield of Appleby Castle. May Queen that year was Catherine Annie Atkinson. This Maypole was replaced by a 77 foot high one in 1908, again donated by Lord Hothfield. In addition to crowning a May Queen other events included a procession, morris dancing, wrestling, blindfold cutting down of a ham, obstacle, potato and sack races. A dance would round off the May Day celebrations. In 1960 a Maypole Committee was formed to raise funds for a new Maypole. The estimate of £80 was proving too costly, however the National Trust were approached and donated a 65 foot Larch. The Boazman family from Millrigg kindly donated the Weather Vane. This Maypole was erected on 27th May 1961. When this Maypole was replaced in 2000 the old Maypole was made into commemorative wooden apples and pears. A sandstone plaque marks the site of this Maypole as the Millenium Maypole was moved to a new site on the same green. The Millenium Maypole was erected with the help of Norweb and funded by a Milleniun Grant fron Eden District Council. Below are some pictures of the 1961 Maypole being replaced on 27th June 2000. A dedication ceremony was held on Millennium Day, 8th July 2000, for the Millenium Maypole. A commemorative stone was laid at the original position of the Maypole. The new 65 foot Maypole was was topped with the now refurbished Weathervane, which had had 2000 added to it. Children of the village were presented with a Millenium Mug showing scenes from around Temple Sowerby. A time capsule prepared by the Village School was buried at the base of the Maypole. The Children depicted memorable events from the Twentieth Century. There are also photos and a video of the village in the capsule, along with three old pennies that were discovered when the old Maypole was removed. A Tea Dance was held followed by a Children’s Disco. Later a barbecue and partying into the early hours rounded off the day’s celebrations. Below are links to the Cumberland and Westmoreland Herald Newspaper that detail the history of the bypass, which villagers of Temple Sowerby had campaigned for over many years. The long battle for the bypass started in the 1960s. Articles below are just from 1998 onwards. Dr. Ainscow worked as a family doctor from 1950 until his retirement in 1987. At the tree planting ceremony in April 2016, Dr. Gavin Young read a short speech of commemoration, detailing events from Dr. Ainscow’s life, his work in medicine and his support for the local community. Dr. Donald, as he was affectionately known by his patients, died in 2014 in Devon, where he had moved in 2001 to be closer to his family. The tree planted is a Sorbus Torminalis, also known as the “service tree”, which was thought fitting, to represent the years of service that Dr. Ainscow had provided to the village as its doctor, and on the parish and church councils. A custom-made traditional tree guard, made by Les Harrison of local company SmallFab, is to protect the tree, which has been planted on the village green very close to the house where Dr. Ainscow and his family lived. Money raised in memory of Dr Ainscow also contributed towards the purchase of a defibrillator and cabinet which has been placed at the Victory Hall, in Temple Sowerby. A considerable amount of the funding for this was raised by Caitlin Davidson, who fearlessly completed the Via Ferrata at Honister slate mine when she was just 10 years of age. Caitlin raised £728 through sponsorship and her contribution meant that the parish council could go ahead with the purchase of this potentially lifesaving equipment. Another young person from the village, Tom Stretton, organised two Heartstart courses, provided by the Murton, Hilton and Appleby Community First Responders. These courses were well attended, informative and much appreciated by the attendees. In June 2017 a Tia, pictured with owner Mandy, had to be rescued after falling into a hole that had just appeared on the village green. Closer inspection showed that this was an old well, which had been covered over a long time ago. It was not marked on old maps of the green, circa 1863 and 1879, although another well is noted on these maps on the Hillside area of the green. A filled in well has also been found behind one of the Hillside properties. A further well has also been uncovered at the front garden of Sheriff House and subsequently filled in. The well has now been filled in and the area regrassed so will it no longer be obvious but the GPS is 54.6391291 -2.6044129. In 2018 the Hall underwent external renovations, removing the concrete render and replacing with traditional render and limewash. When the render was removed the attractive sandstone beneath was revealed and it was decided to keep the upper half visible. There is also a new roof. In 2019 the lower two rooms will also undergo renovation.